1934: Supreme Court Building Commission created. The commission purchased the land upon which the original building sits from Mrs. N.B. Laughlin. 1937: Supreme Court Building construction was completed at a cost of $307,000. The Building remains the only Public Works Administration project in New Mexico that is still being used for the original purpose for which it was built. In addition to the Supreme Court, the building originally housed the State Treasurer's Office and Attorney General’s Office, which have both since relocated to other buildings in Santa Fe. The Court of Appeals, created in 1965, now occupies the space that housed the State Treasurer's Office and the Attorney General's Offices. WPA artisans were commissioned to create the unique chandeliers and window leading in the Supreme Court Courtroom. All of the woodwork is hand carved especially for this courtroom. WPA used the same style of striker plate in all of their projects. The only difference is in the circular portion where ours has a zia sun symbol and the Empire Building, for example, has the New York state flower in it. With the exception of the carpeting and draperies, the courtroom looks today just as it did in the 1930's. 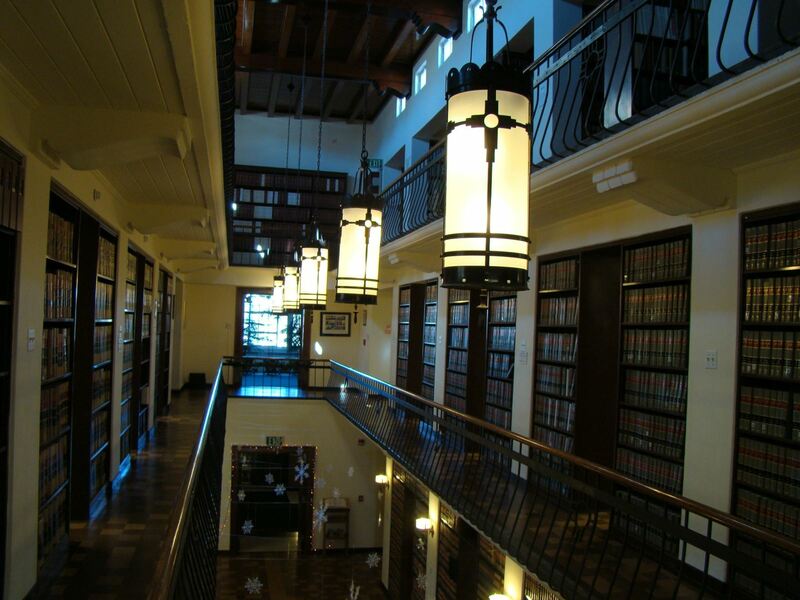 Cork flooring was used in the 30's for the law library and the Supreme Court courtroom. Over the years, damage to the flooring has occurred from women's high heel marks. The building has three elevators, two of which were installed in the 30's. A small private elevator is located adjacent to the Justices’ robing room, where the private deliberations take place to this day. Justices used to ride this elevator in order to slip into the robing room and avoid contact with the parties and their lawyers. This elevator and the small elevator in the law library have been retrofitted with modern control systems with sophisticated electronic components to replace the original traction systems. A third elevator was installed in the early 60's during the addition to the building and now serves as the main public elevator. 1940s: The tradition of honoring former chief justices began in 1942 with the commission of a bronze tablet of Chief Justice Frank Parker. Since then, portraits of former Chief Justices have been hung outside the foyer of the Supreme Court Building on the second floor, in what is now known as the Hall of Chief Justices. No state funds are used in commissioning the portraits. Generally, the families and former firms of the particular justice pay for the portrait. The most recent addition to the Hall of Chief Justices was the portrait of Hon. Richard C. Bosson in 2015, who served as Chief Justice from 2005 to 2007. The collection remains incomplete. In 2007, the first female Justice of the New Mexico Supreme Court, Hon. Mary Walters, was made an honorary Chief Justice by order of the Supreme Court, and her portrait was moved into the Hall of Chief Justices at that time. Since Justice Walters term on the Supreme Court, only four other women have served as Justices on the Supreme Court. Hon. Pamela B. Minzner, Hon. Petra Jimenez Maes, and Hon. Barbara J. Vigil have all served as Chief Justice, with Justice Maes serving two terms as Chief Justice. A historic milestone was reached in December of 2015 when Hon. Judith K. Nakamura joined the Court and, for the first time ever, a majority of the seats on the Court were held by women. 1950s: In the 1950's, the building was a designated fallout shelter; k-rations, water, and other supplies were stored here for many years. That part of the building basement is now used by the Supreme Court Law Library for its collection and archiving activities. The land on which a later addition to the building now sits was originally owned by the family of deceased federal judge Hon. Oliver Seth. From 1954 until the sale of the property, the building commission leased the property, which included the Seth family home. 1960s: In 1963, prior to the construction of the addition, the Seth property was re-appraised and valued at $3.00 per square foot, "which was compatible with the surrounding area" according to the architect/engineer who performed the appraisal. The Seth family sold the land to the building commission in July of 1964. In 1965, the new addition to the Supreme Court Building was completed to house the judges and staff of the newly created New Mexico Court of Appeals. 1980s: In the early 1980's, former District Judge Michael Franke, then Secretary of Corrections under ​Gov. Anaya, was the only person to lie in state in this Courthouse. He was murdered in Oregon while serving as Secretary of Corrections for that state. 1990s: The building underwent major renovations in the mid to late nineties. A new public entrance at the south side of the building was remodeled to comply with ADA standards, as were several restrooms. Baseboard molding matching that in the original part of the building was installed in the new addition; custom designed carpeting and window treatments were installed throughout, designed by interior designer Ms. Gene d'laurel Pattison of Santa Fe. Ms. Pattison, an expert in territorial design, was consulted by the Commission to carefully coordinate the interior renovations. A digital telephone system was installed throughout the building in 1995. 2000s: On July 21, 2000, the Supreme Court Building was added to the State of New Mexico Register of Cultural Properties, On January 18, 2002, the Supreme Court Building was placed on the National Register of Historic Places by the United States Department of the Interior. The Supreme Court Building also is recognized by the City of Santa Fe as a "significant structure in the downtown historic district," and registered by the Historic Santa Fe Foundation as a building worthy of preservation. A series of projects have been completed by the Supreme Court Building Commission since the turn of the century as part of the Commission's ongoing efforts to preserve the historic integrity of the building while incorporating modern upgrades throughout the building. In 2000, the Supreme Court Clerk's Office underwent a minor renovation. The exposed piping was encased. In addition, the Court of Appeals installed new seating, changing from theatre-style seating to benches. In 2004, a major renovation in the original part of the building took place from June to December. The steam boiler was converted to hot water heat. All radiators and thermostats were replaced and all domestic water pipes were replaced. The electrical system and fire alarm system were upgraded; voice and data lines were added to both appellate courtrooms. In 2014, the replacement of all twenty roofs that cover the Supreme Court Building was completed. In 2015, a significant renovation to the Supreme Court Law Library was completed, which included replacing cork flooring throughout the building and installing a new circulation center on the first floor of the library. In 2016, a major renovation to the exterior of the building was undertaken to re-stucco the entire building and repair and replace all exterior balcony railings and other exterior workwork.